The Canadian Police and Peace Officers’ Ride to Remember committee is proud to commemorate the 17th Canadian Police and Peace Officers’ Memorial Ride to Remember by participating in a 700-kilometre bike ride in honour of officers who have made the ultimate sacrifice for their community. The ride will start on Wednesday, September 20, 2017 at 7:30 a.m. at the Ontario Police College (OPC) in Alymer and will conclude on Saturday, September 23, 2017 at the Canadian Police and Peace Officers’ Memorial in Ottawa. 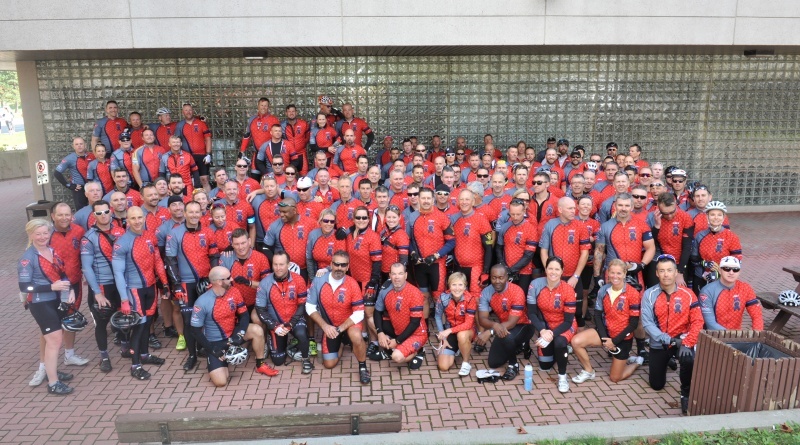 Members of the Ride to Remember team will also meet up with the National Police and Peace Officers’ Run to Remember at the Ontario Police Memorial, 22 Queens Park in Toronto, on Thursday, September 21 at 8:00 a.m. for a brief ceremony. Thanks to a generous corporate sponsorship from Canadian Tire (CT), members of the Ride to Remember will be stopping at CT locations along the route including Jerseyville and Gananoque and will participate in a bike rodeo and barbecue at the Brockville CT, 2360 Parkedale Avenue, on Thursday, September 21, at 5 p.m. More than 50 kids will greet the Ride to Remember team and receive new bikes, courtesy of the Canadian Tire Jumpstart program. The media is invited to join us at the OPC, the Ontario Police Memorial or at any of the CT stops along the route. Riders will be available for interviews. The purpose of the ride is to raise awareness of the annual Canadian Police and Peace Officers’ National Memorial Service, where we pay tribute to more than 860 fallen officers. The 40th annual Canadian Police and Peace Officers’ Memorial Service will take place at Parliament Hill in Ottawa, on Sunday, September 24, 2017 at 11 a.m.
For more information, contact the Canadian Police and Peace Officers’ Ride to Remember Strategic Communications Specialist Susan Gibbs at 905-717-8352.